There’s nothing quite as delicious as really (REALLY) fresh fried food. Fried chicken, fried onion brings, fried dough, and all kinds of fried desserts and snacks – everything just seems to place a little bit better after it has spent a little bit of time in any bit of frying oil. Unfortunately, most of us aren’t all that comfortable tackling the task of doing a little bit of deep frying without the proper home deep fryer to do it in. 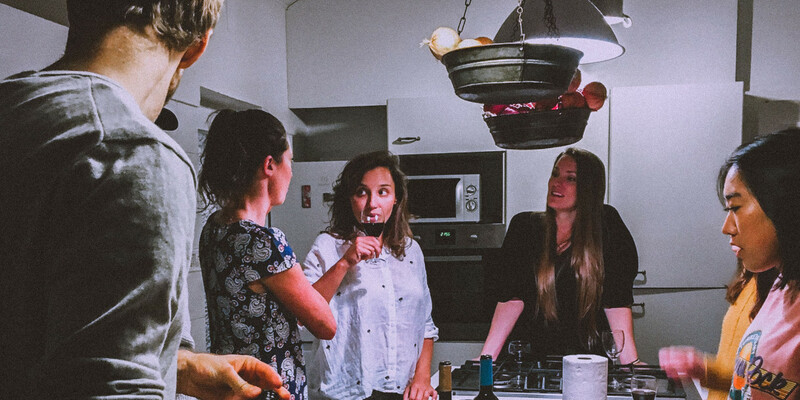 Sure, you could attempt to fry up some chicken or some other dishes in a Dutch oven or a deep cast-iron pan – but why run the risk of ruining your food (and potentially putting yourself in a dangerous situation). Thankfully, with the insider information below about how to choose the best deep fryer for home and for the money, you’ll never have to worry about that headache or hassle never again! Of all the home deep fryer options available on the market today, this just might be the most impressive. One of the most complete and easy to use deep fryers specifically made for home cooks, it’s generous 2.65 pound capacity makes it perfect for those that need to fry up a considerable amount of food at once to feed a large family. Energy efficient, it isn’t going to put a hurting on your energy bills from month to month, either. It uses a powerful but efficiently designed 1700 W power supply to produce the heat necessary to get 3.5 L of cooking oil up to the right temperature, and then hold that cooking temperature throughout the cooking period. Beautifully designed, this entire home fryer is made out of stainless steel and will look perfect in any kitchen. The 2.65 pound/3.5 L capacity is going to guarantee that you’re able to cook and prepare pretty much anything you throw at T-Fal FR8000 (albeit not a whole turkey), giving it a lot of versatility that it might not have enjoyed otherwise. All interior components are dishwasher safe, and there is a “permanent odor lock” to make sure that you never have to deal with any unpleasant smells when storing cooking oil. This particular deep fryer is a little bit on the expensive side of things, coming in at anywhere between $125 and $200 or more. That being said, it’s definitely worth the premium price tag. If you are serious about doing more than a little bit of deep frying, it really doesn’t get any better than the T-Fal FR8000! 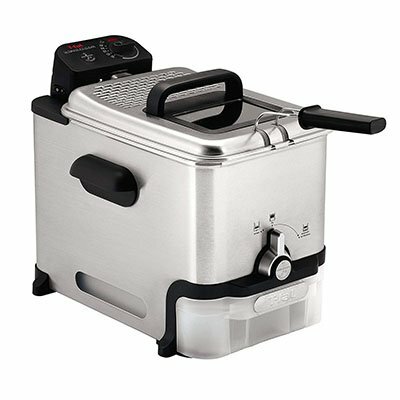 Presto has always been responsible for some of the most effortless to use deep fryers on the market, and are quite literally the “granddaddy” of the portable and compact deep fryer segment. 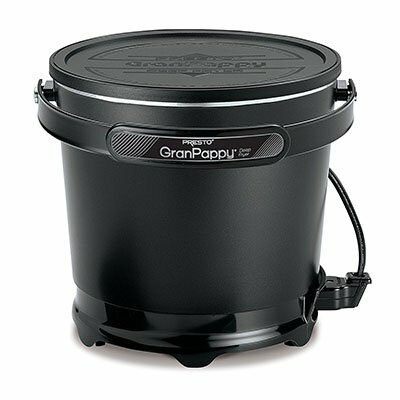 It should come as no surprise to anyone that they would name their flagship deep fryer the “GranPappy”, and it also shouldn’t come as a surprise that it is one of the best deep fryers on the planet today. Compact, portable, and taking advantage of the most simple and straightforward method of eating up cooking oil, this heavy black cast aluminum solution is going to be able to tackle pretty much anything and everything you throw at it. Heating the oil (a 1 gallon capacity) up with a 1500 W electronic temperature control module, this intelligently design “bucket” is going to keep that heat locked in so that you don’t have to worry about fiddling with any controls when cooking. As simple and straightforward of a deep fryer as you are going to come across today, absolutely everything about this Presto deep fryer has been designed to make it almost impossible to screw up. All you have to do is fill up the actual container with your cooking oil (up to 1 gallon), flip a switch located at the electrical module, and then sit back and relax while the entire system comes up to temperature. Then dip your food into the oil (using the included deep fryer basket/spoon tool) and you are off to the races! This isn’t quite as attractive as some of the other deep fryer options out there right now, and does not have the same kind of extreme capacity that other fryers at this price point usually enjoy. If you want a real “set it and forget it” kind of solution for your next deep fryer, you want to get your hands on this Presto model! For decades now Cuisinart has been responsible for some of the best small kitchen appliances on the planet, and this compact deep fryer is no exception. Intelligently designed if not a little bit undersized, everything about this countertop deep fryer is very personal. All of the controls are manually operated, the food must be dipped in and then removed by hand without a timer going off, and the overall size (we’re talking about just a 1.1 L capacity that can handle about three quarters of a pound worth of food to be fried) makes this an intimate kind of appliance. Still, for the right person – a bachelor, a student, or someone just looking for a compact fryer for “single serving” kinds of fry ups – this is literally as good as it gets. Cuisinart products have always been ridiculously durable and super simple to use, and the CDF 100 fryer is going to continue that legacy going forward. 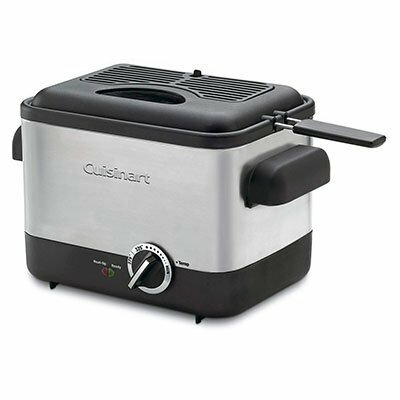 Manufactured out of durable construction materials (and lined with a 100% safe nonstick die-cast bowl), this Cuisinart should last for at least 10 to 15 years – even with regular operation – before it even begins to show any signs of normal wear and tear. The other real beautiful aspect of this particular deep fryer is that it is going to give you the opportunity to fry up smaller amounts of food. 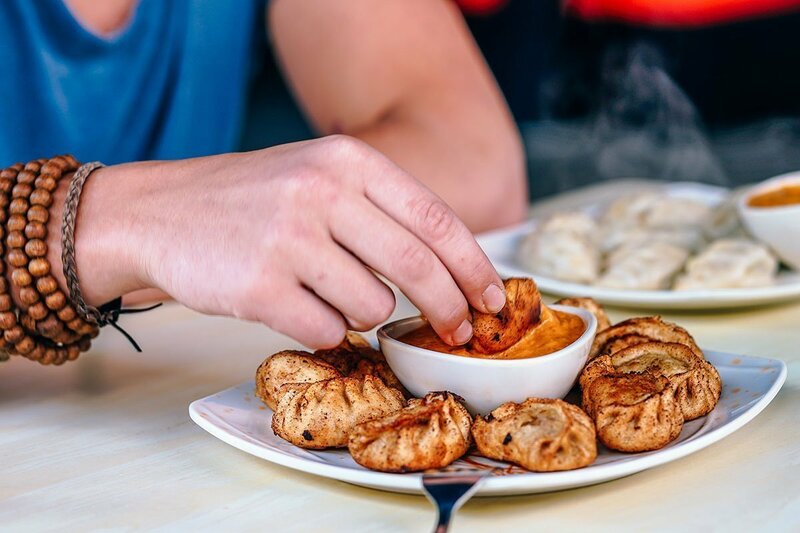 We all know that fried foods probably aren’t the healthiest in the world, and frying up smaller quantities of those foods can help us with portion control when we would have possibly gone overboard otherwise. The only real knock against this deep fryer is that it is a bit on the expensive side of things when compared to competing products. It’s not difficult to find products at the same price point that are capable of double the capacity with a lot of other “fancy” features to boot. Those that do not require and oversized deep fryer – or those that just want to save a bit of counter space along the way – are going to want to look closely at the Cuisinart CDF 100 deep fryer. While not nearly as fancy as some of the other competing options in this list, the Hamilton Beach deep fryer is definitely worthy of your consideration. Powerful, compact, and intelligently (not to mention attractively) designed, this Hamilton Beach deep fryer is going to give you absolutely everything you’re looking for in a compact deep fryer without going overboard. You’ll be able to heat up to 8 cups of oil in just a few seconds (maybe a minute or two maximum), and then effortlessly cook up to 6 cups of food in that oil with ease. And that’s just the tip of the iceberg! This is very much a safety first focused deep fryer, giving you all kinds of bells and whistles – and alarms – to make sure that you know exactly when your oil has reached cooking temperature, when your food is done, and when your oil has cooled down enough to safely move or remove the inner modules. Cool touch sides make sure that you aren’t going to accidentally burn yourself, and a magnetic power cord guarantees that there aren’t any trips and falls that could send 8 cups of superheated oil all over the place, either! A little bit cheap looking (but it’s also one of the least expensive options out there), this isn’t exactly the kind of deep fryer that you’d want to leave out on your countertop if you’re going for a higher-end look in your kitchen. Aside from that though (and the small cooking capacity), there really isn’t much to dislike about this unit. 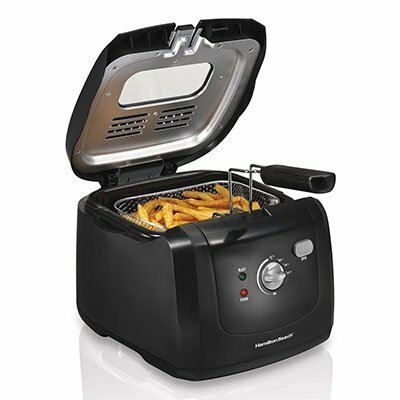 Cheap, reliable, and from a name that you can trust – the odds are pretty good that you’re going to really like this Hamilton Beach deep fryer! These are usually restaurant size deep fryers that can handle gigantic orders and even whole turkeys – or a couple of whole turkeys – and are usually only for those that regularly deep fry gigantic quantities on a regular basis. They cost a lot to install and run (not to mention clean and maintain), but they will last almost forever when taken care of properly. These deep fryers are very, very accurate when it comes to heating up cooking oil to a very specific temperature – and then holding that heating oil at a particular temperature – which gives you complete and total control over the foods that you are cooking. They aren’t going to be as easy on your electrical bill, however. Specifically designed to use cooking fats that are significantly “heavier” than traditional cooking oil, a deep fat fryer gives off a very distinct and specific kind of flavor – a flavor that most people have absolutely fallen in love with. A little bit more expensive than other options You might want to look into one of these if you’re a traditionalist. Similar to more traditional electric deep fryers, these deep fryers are going to run off of propane or natural gas, which usually makes them considerably cheaper in the long term. Obviously, though, you’ll have to make sure that they always have fuel – and they can be a little bit more dangerous than traditional electric fires. Some of the most versatile and easy to use fryers are specifically intended for outdoor use only, as they would otherwise represent a safety risk if they were fired up in the home. These are oversized units (most of the time), though they make compact outdoor fryers that you can bring camping there. Pitch perfect for those that live in a small apartment, or are students, or just want to be able to quickly crank out a batch of fried food as quickly as possible, small deep fryers and portable deep fryers are inexpensive alternatives to some of the larger units on the market right now. The best small deep fryer is one that can handle the capacity that you anticipate cooking up on a regular basis without breaking a sweat! A bit of a new approach to the “deep frying” style of cooking, air fryers take advantage of new convection technology to fry your food up using nothing more than convection heaters as opposed to saturated oils and fats. It is supposed to be a much healthier way to fry up food. Another spinoff on the traditional “deep fryer”, oilless deep fryers (also called no oil fryers or oil free fryers) take advantage of a variety of different technologies – convection heat, induction heat, indirect/infrared heat, etc. – to fry up food without any cooking oil. These are the kinds of deep fryers that you would usually find in a restaurant, and are perfect for those that want to be able to “double fry” foods like wings – or just want to be able to set one cooking oil to a specific temperature to prepare one meal and the other side to a lower (or higher) temperature to tackle something else. Countertop deep fryers are built right into the countertop, providing a seamless appliance kind of look that most commercially available deep fryers cannot pull off otherwise. You’ll definitely want to speak to your interior designer, your architect, and your builder before adding one of these to your floor plan. As mentioned above, it is perfectly possible to deep fry foods – pretty much any food that you could deep fry in a fryer – just by heating up some cooking oil in a cast-iron pan or using a Dutch oven. After all, that’s how they used to do it in the “old days”. If you’re looking for a more traditional approach, this is the direction that you’d want to go to. Hybrids between pressure cooker technology – designed to speed up the cooking process dramatically – and deep fryer technology, you’ll be able to whip up your favorite deep fried foods in half the time when you use one of these ingenious little devices. More and more people are processing their frying oil (some are even turning it into biodiesel for their vehicles), but you aren’t going to be able to effectively reuse your frying oil after it has reached its expiration date unless you can filter out burnt food particles that are settled into the mixture. One of these fryers takes care of that problem forever. There is a world of difference between choosing a countertop style deep fryer and a turkey fryer/chicken fryer, and you’re going to need to know what those differences are before you even think about pulling the trigger on this kind of purchase. Turkey fryers (and those that can handle multiple chickens at once) are usually incredibly large and very, very dangerous – most of them run off of propane/natural gas and are filled with gallons of hot cooking oil just ready to ignite without any warning whatsoever – so be sure that you know exactly what you’re doing, and exactly what you’re looking for, before you purchase one of these options. Check out our comparison table below to get a great idea about not only what to look for in a turkey/chicken fryer, but also a little bit of inside information about what we feel are the best turkey deep fryers for the money are right now. There are a lot of different things that you are going to want to think about before you pull the trigger on a deep fryer purchase, but we are going to break down the most important ones below. This isn’t exactly going to be the most expensive purchase you make, but it’s going to be an incredibly important of your kitchen. Choose the right deep fryer and you’ll be able to enjoy perfectly fried foods whenever you feel like it – choose the wrong one, and not only will you fight your deep fryer every single step of the way, but you’ll also risk burning your house to the ground faster than you ever would have thought possible. Here are a couple of key things that you’ll want to look into before you purchase a deep fryer. You are going to want to be sure that you are purchasing a deep fryer that can get a cooking oil up to at least 500°F (if not higher). Anything that isn’t able to heat up a cooking oil to that kind of temperature really isn’t worth purchasing, as you will lose way too much heat when you try to cook up the bulk amounts of food at once. Not only that, but there are some fried foods that require you to bring the heat ALL the way up – and if your upper ceiling is only about 450°F or so, you simply won’t be able to tackle those kinds of recipes. What Kind of Capacity Are You Looking at? Some people are going to be able to get away with a rather small deep fryer, one that only holds a couple of servings at once – but because of their specific needs, that’s going to suit them right down to the ground. However, those that are planning on using their new deep fryer for entertaining, have a large family to feed, or just like frying up a bunch of food at once are going to want to get their hands on something considerably larger. Some of the biggest deep fryers for home use effortlessly hold between 40 pounds and 75 pounds – and that might be something that you need to look into. How Versatile a Fryer Are You Looking at? The market is absolutely overflowing with “multipurpose” deep fryers designed for home use, but the cold hard truth of the matter is many of them are nowhere near as versatile as they claim to be. A lot of this has to do with the two critical aspects of a deep fryer that we illustrated above, but there are other things that you want to look into that determine just how versatile your deep fryer is. For instance, you’ll want to find a deep fryer that offers multiple temperature settings – and gives you a clear indication of when you’re cooking oil has hit one of those temperatures. Secondly, you’ll want to look for fires that can handle and accommodate pretty much anything and everything you throw at them as far as fried foods are concerned. Lastly, you’ll need to be sure that your fryer can cook with multiple different types of oil, opening up all kinds of recipes that you simply wouldn’t have been able to tackle otherwise.